What a magical time December always is. So full of family and friends, and the general feeling of joy and love and cheer, I love it! This month absolutely flew by, though. I think the older I get, the busier things are, the more life grows wings and soars with the peregrine falcons, a break neck 240 mph. Jeffrey surprised me and offered to do the stockings on his own. He also wanted to do a lot of Christmas shopping on his own, but that made me a bit nervous, and I agreed he could do the stockings, but we had to do the regular shopping together. Thank you Amazon for making Christmas shopping so much easier for us! We simply browsed, clicked, and checked out in one night, from our bed. And that, my friends, is how to do Christmas shopping! By the time Christmas Eve came, though I was very nervous for the stockings. I mean, Jeffrey often does things his own way, which are way off from how I would have done them, and sometimes that makes me nervous. Because this year, he got the kids a ream of paper. From him. A ream of paper, I said. Each. And he was incredibly proud of that gift. Now to be fair, the kids love paper. They love to draw, and cut and fold and create with paper. 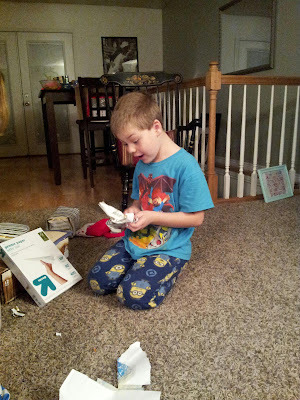 They love to have their own paper, so while it is an odd gift to give to a 2, 6, and 8 year old, the children were incredibly excited to get their very own ream of paper to do whatever they wanted with. The thing that made me the most nervous, though, was the fact Jeffrey was being so secretive about it all. He wouldn't let me help him assemble the stockings, he kept insisting I go to bed, and he was just very odd about the whole thing! I shouldn't have been, though. See, in our house, Santa does the stockings and we do the gifts. We only give them 4-5 gifts each, and we don't want all the credit taken away from us, so we let Santa do the stockings. And Jeffrey was a fabulous Santa! 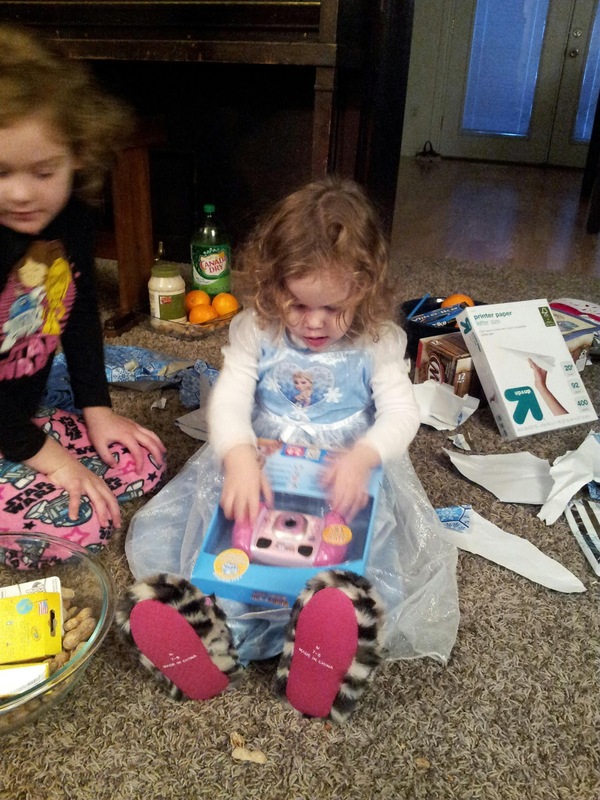 Santa was creative, and wonderful, and the kids were thrilled! They found their stockings lined up on the floor in front of the fireplace with a blanket over them. Beneath each stocking was a 12 pack of soda. Keith got root beard (which is what he calls it. Because we don't drink beer, he informed me), Faye got pink lemonade, and Beth got grape shasta, while I got a Martinelli's sparkling cider. We each got an impressively official looking certificate from Santa. 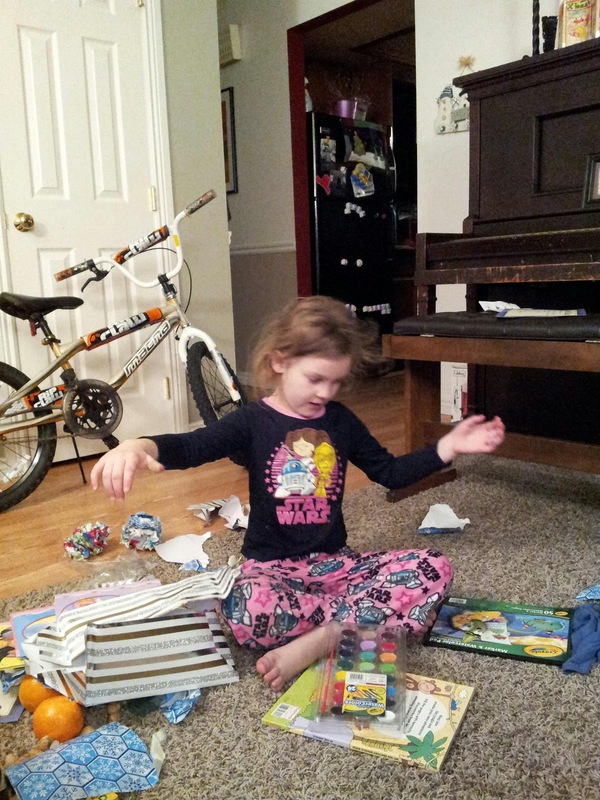 Beth's said she gets 5 stories read to her by her daddy. Faye's said she gets to go on a 3 hour date with her daddy. Keith's said that he gets to play video games, eat pizza, and drink root beard with his daddy for 3 hours. Mine said I get a date, and one conversation on demand with my husband (which is really quite generous, if you think about it. He lives in his thoughts quite often, so being able to demand he talk to me when I want will really be wonderful!). Jeffrey got a certificate that said he gets to sit on his 3 kids. He redeemed his right then and there despite the squealing laughter and protests. Beth didn't quite understand why her daddy was sitting on her, but the older two thought it was the funniest thing in the world! 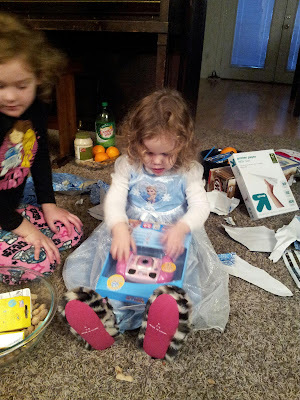 The kids also got oranges, peanuts and almonds in their stockings, along with one box of their favorite type of candy. In place of candy, Jeffrey Santa gave me some tortilla chips and salsa, while he got mayo in his stocking. So, while our stockings were far from traditional, Jeffrey did a great job! We gave Keith a bike this year. Not that we are cool parents or anything, because we aren't. My uncle was getting rid of one that is Keith's size and asked if we wanted it. The fact that Keith doesn't know how to ride a bike yet has bothered me for a long time. He reads far too much Calvin and Hobbs, and I think Calvin's fear of bikes has rubbed off on Keith. He keeps talking about falling and getting your face stuck in the chain. I've explained many times how nearly impossible that would be, but he is still worried about riding the bike. I think we are going to teach him in the church gymnasium as it isn't frigid in there, and it will be easier to fall on the gym floor than on concrete or a black top. Faye is fit to burst with excitement over the prospect of having her training wheels removed and to be able to ride her bike for real. I am excited to teach them, and for them to gain the freedom that bike riding gives. I roamed all over my city when I was growing up. I lived on my bike, and I really miss riding one. Jeffrey has one in the shed that I am going to pull out this spring and the big kids and I will go bike riding around the neighborhood, or on the trail near our house. We even inherited a bike trailer when we bought this house, and I am eager to hook it up and to be able to take Beth and the baby in it... if I could just trust Beth to not injure the baby. I really worry about that. Faye got art supplies. 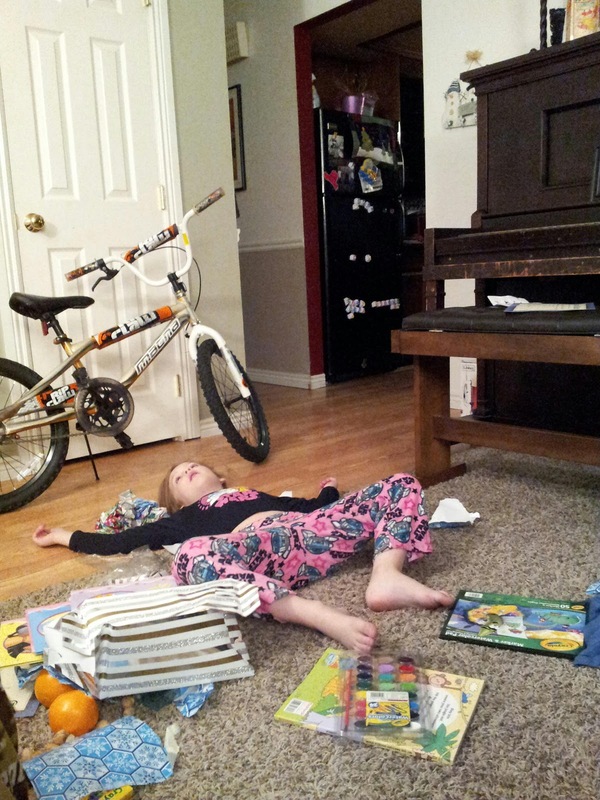 She pretended to faint from the excitement. All Beth really wanted was a camera. It was hard to get a good picture of her face, but she has been absolutely thrilled with the camera, and playing with it every day. And then, because I have two absolutely amazing people in my life, I was given the most amazing gift ever! 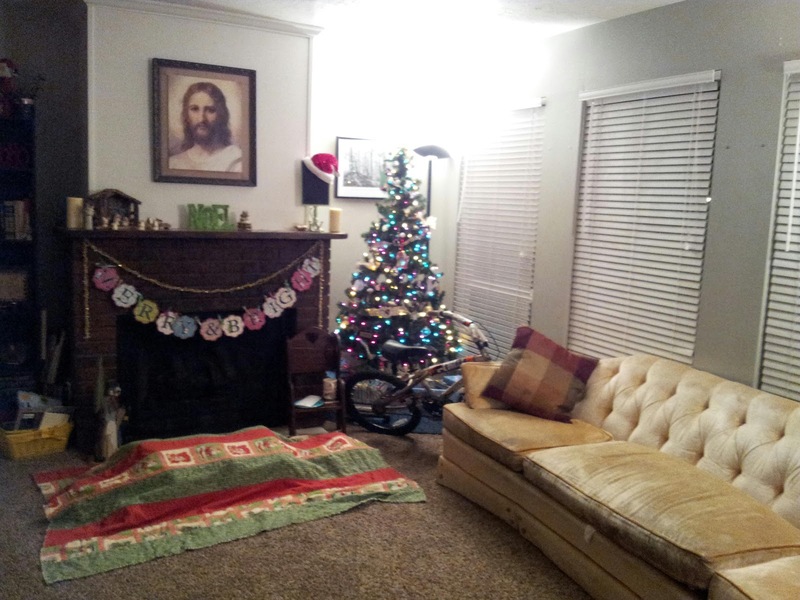 Adrienne found some breathtaking china on KSL for crazy cheap. 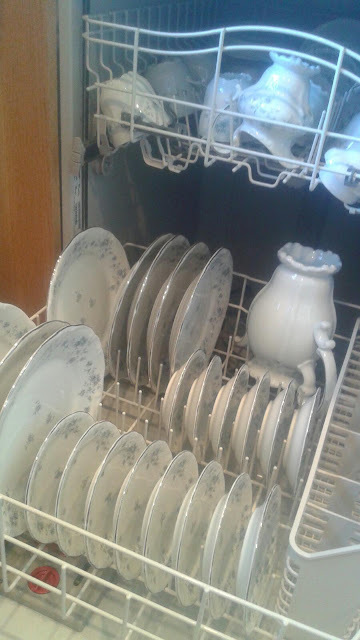 When she saw it, she thought of me, knowing I love beautiful dishes, I have been searching for a set for a while now, and that when I saw those, I would have to have them. She sent me a picture. I swooned. How could you not?! I asked Jeffrey if he was good if I spent $50 for china. Jeffrey, being the ever practical penny pincher laughed and asked why I needed them. I tried to explain, but none of my justifications could convince him that they were anything more than a want. Sadly, reluctantly, I clicked away from the page and mourned the fact that I still don't have a decent set of plates for fancy dinners, or when company comes. But then, Adrienne always has my back. She understood the way these dishes called to me and decided to haggle the guy down, and get the dishes set for me anyway. She planned to call Jeffrey and get him to say they were from him, but she didn't know how to contact him as he doesn't facebook, and she doesn't have his number. Except I showed up at her house while she was washing them, and then the cat was out of the bag. But look at them! Oh my stars, they are exactly what I have wanted! Silver around the edges with a very delicate design that isn't too busy or obtrusive, but dainty and appealing. Plus, the pale blue just makes me that much happier! I don't have an excellent picture of them yet, but I can't wait to one day get a china closet to display them in. For now, they will have to stay in the box, safely tucked away in my office where I can pull them out and swoon any old time I want. Christmas is through and over now. I am happy that I can take my decorations down now. I am not a huge fan of the Christmas decor, I am not sure why. 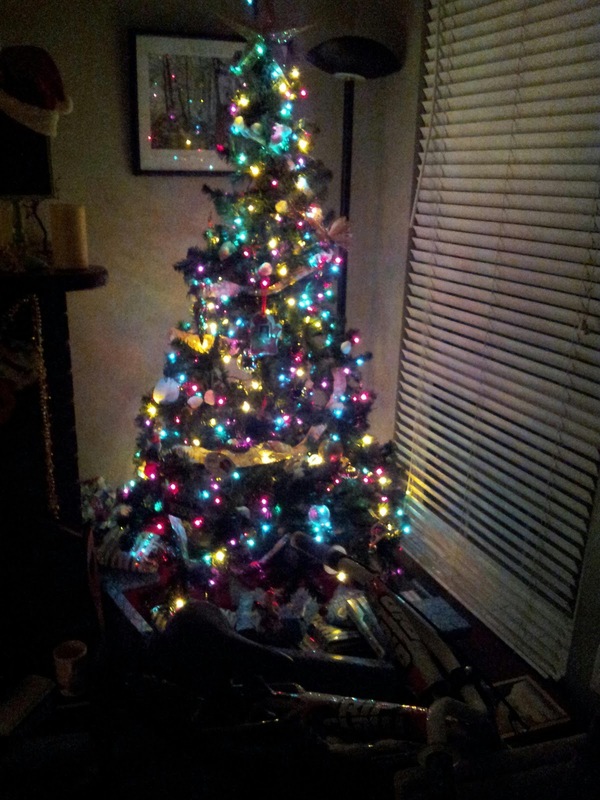 It takes me forever to get it up, and I usually get it down within a few days of Christmas, if not the day of. But I came down with something the day after Christmas and so haven't had a chance to do much in the way of packing up Christmas. Meanwhile, the kids have been so happy making messes with their paper all over the house. Everyone got several books for Christmas, so we have been having lots of reading time. Sometimes the kids and I will light a fire and cuddle up in front of the gorgeous flickering flame to engulf ourselves in a literary experience. That is what I call it. The story that wraps around you, transporting you, while the flames warm and soothe is just perfect and ideal, and I when I get to snuggle up with the little bodies of my kiddos, feeling their breathe catch at the exciting parts of a story, or feeling them surge with empathy for the characters is such an amazing experience! 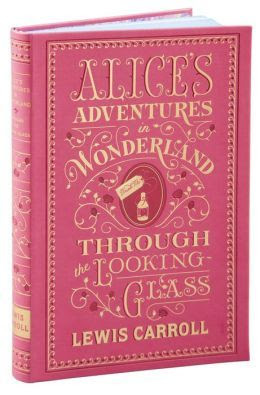 Jeffrey gave me a beautiful leather bound copy of Alice's Adventures in Wonderland and Through the Looking Glass. To hold that book in my hands is nearly inexplicable. The feeling that flows through my fingertips at the touch of that beautiful volume is electrifying. And then reading it to the kids, letting them experience Wonderland through their eyes, their minds, and not through the depiction of Disney or Tim Burton is what magic and story-telling is all about! Next on my list is either Peter Pan or The Wizard of Oz. Both books are so different from the movies, and so magical and oh so much better! I can't wait to introduce my children into these worlds of wonder and adventure! Meanwhile, Keith is reading Janitors, which makes me happy, too. I love seeing him curled up on the couch with a book, Faye usually laying on the floor next to him with her colored pencils and paper in front of her, doodling or concentrating on her next masterpiece. It makes my heart sing to see them thus engaged. What a dreary world people without a love of books must live in. I must say, though, I am excited to begin a new year and have all of the promise of new beginnings. As I look back on it, 2015 was a rough year, full of ER visits, tragedy, loss, and just getting through things. I am so excited and anxious for all of the beautiful and wonderful things that await me just around the corner of a fresh new year. For some reason I don't like Christmas decorations either. I took mine down on Christmas. The llama got the tree as a snack. They've pretty much munched the whole thing!! I really enjoyed the Christmas stocking story. Trust a man to make it original! And the plates are beautiful! You'd better use those plates! Thursday lunch is a perfect time, if it makes your heart happy.